Does It Ever Feel Like You’re Always Just At The Edge Of What You Want In Life? Like maybe you’re not destitute – but you’re still far from financial freedom, you’re not hitting your financial goals fast enough, and you still worry about money a little too often for comfort. Or maybe you’re not horribly unhealthy – but you still struggle with fatigue, pain, excess weight, or premature aging, and it sometimes just feels like you were ‘born that way’. Or maybe you’re surrounded by people you love – yet you still tolerate a lackluster romance, or yearn for something more real, or just wish you could end a stubborn conflict that’s been dragging on for too long. It’s not because you’re not working hard enough, or that you’re not lucky enough, or even that you’re too far gone. It’s simply that your brain has been programmed by society – the media, your mentors, and even your parents – to pin you down in a comfort zone devoid of true abundance, fulfillment, and unconditional joy. The truth is, it’s not easy to break through your own mental barriers and reprogram yourself to have it all (if it were, anyone who reads a personal growth book or went for a therapy session would be living their dream life). But thanks to the latest breakthroughs in leading-edge neuroscience, that’s about to change for you forever. Did You Know That Your Brain Can Reprogram Itself – And Literally Change Who You Are on a Cellular Level? What you’re about to discover goes far beyond the typical tools of personal transformation. There is now an even MORE efficient, rapid, and lasting way to spark profound transformation from the inside out. And reprogram yourself rapidly and with no resistance into the BEST version of you. This is what you experience in the Rapid Transformational Hypnotherapy for Abundance Quest: a 35-day journey towards life-changing new levels of financial success, health, and love all through hypnotherapist Marisa Peer’s remarkable approach to personal transformation. Rapid Transformational Hypnotherapy for Abundance gives you all the instant benefits of years of therapy in just one session, by reprogramming the mind. But there’s something specific going on when you rewire your brain, and it’s connected to your body’s neurons: the basic working units of the brain, designed to transmit information to other nerve cells, muscle, or gland cells. These neurons form a neural network, or a ‘brain map’ that directs your brain to tell the rest of you what to do, think, and feel. Studies show that while these neurons control everything about our bodies, we can constantly create new controls through a bodily process called neurogenesis. And once these new control systems are created, research shows that our brains then treat old neurons that aren’t “plugged into the new network,” like survival of the fittest. Which means new neurons win. But once these new control systems are created and plugged in, they need to be told what to do. These new brain cells receive programming through neuroplasticity — it’s the brain’s ability to create the neural pathways that tell you what to do. But these pathways must be intentionally set. Once the old neurons are out, we have to create a roadmap for the new neurons to follow. Research suggests that in remapping, we can improve our choices, create new habits, and even possibly forget old memories. There is no such thing as being born lucky or more successful in life. In short, we can literally reprogram who we are on a cellular level, to not just change the flow of abundance, but change our habits, thoughts, and even our characteristics to create and receive abundance naturally. Marisa Peer, named the Best British therapist by Tatler and Men’s Health magazines, has spent nearly 30 years working with an extensive client list including royalty, rock stars, Hollywood actors, Olympic athletes, CEOs and political leaders. As a hands-on therapist to her clients, Marisa uses Rapid Transformational Therapy™ to unlock the brain’s natural ability and help her clients literally rewrite their brains for performance, past issues, and capacity for abundance. In her work with champion athletes, stars, and the world’s top business leaders, she has noticed a recurring theme of maximizing abundance to virtually remove all limits and open the door to the lives they want in health, wealth, love, and more. For this reason, Marisa has chosen to bring abundance to the Mindvalley Community. Marisa also lectures, writes columns and appears on television and radio all over the world. She’s written four bestselling books, on how transformational hypnotherapy can help people lose weight, get pregnant, gain confidence, and stay young. In this Quest, Marisa will demonstrate the instant transformation that’s possible with her unique, highly personal approach to hypnotherapy. Marisa was the most featured teacher in Vishen Lakhiani’s book The Code of the Extraordinary Mind. Marisa leading 800 Mindvalley students into hypnotherapy. Marisa recently won these Stevie Awards: Woman of the Year, Entrepreneur of the Year, and Lifetime Achievement Award. I have been a relationship coach & an emotional healer for years – and have learned many many modalities to help myself & my clients. Just by listening to Marisa’s practical & wise teachings about the brain & life – as well as using her powerful hypnotic recordings, I have been able to turn around stubborn self-destructive patterns & unconscious ways of thinking that I’ve not been able to do with years of self-help, therapy and numerous other modalities. I am so very grateful to Marisa! 3. Quest is designed for micro-learning: 20-40 minutes a day. 20-40 minutes a week is all you need to watch your video lessons, practice your exercises, and awaken the power of Becoming Limitless in every area of your life. The Rapid Transformational Hypnotherapy for Abundance Quest breaks you free from the beliefs, thoughts, and programming that have caused you to unknowingly reject your best life. As you progress through the Quest, you’ll notice life-changing transformations that lead to more career opportunities, limitless spiritual growth, better business dealings, clear connection to your life’s mission and more. This is the exact same process Marisa uses with her top shelf clients – including Olympic athletes, CEOS, celebrities, and many members of our Mindvalley Tribe just like you. That’s how we know you’ll experience lasting changes in your mind, that lead to lasting changes in every area of your life. Our goal at Mindvalley is to evolve the global education system. And to spread transformational lifelong education to every person on every corner of the planet. Because we believe in elevating the lives of billions/helping others rock their greatest lives, we’ve designed the Rapid Transformational Hypnotherapy for Abundance Quest to reprogram your mind for extraordinary success in your wealth, health, and relationships at a more affordable price than you’ll find anywhere else. This means you’d end up spending thousands of dollars to only begin to scratch the surface of issues that you’re directly addressing and eliminating in the Quest. But since the Quest happens online in a group setting (without sacrificing on the personal touch, thanks to our immersive Quests platform) – we’ve been able to drive that cost way down for you. And so this transformational experience won’t cost you $3,000, or $2,000 or even $1,000; but just a one-time investment of $399 for a lifetime of abundance. You won’t find this complete life shift for this price anywhere else. “Marisa Peer received her training Hypnotherapy and Psychotherapy at the Hypnotism Training Institute of Los Angeles located in Glendale on August 23, 1985, and completed her certification program on September 02, 1988. In the ensuing years, I had the opportunity to have the pleasure of Marisa’s attendance at specialized training programs I presented in the United Kingdom and the United States. “Marisa Peer is an absolute marvel she not only changed my life —she actually saved it. Within two weeks of having just one session with her I stopped smoking and drinking for good and developed a completely different attitude to food. When you’re buying a car, you can test drive it. When you’re buying a house, you can take a tour of it. We believe you should have the same peace of mind with your education too – so we’re giving you up to 10 risk-free days (10 days from the start of Quest) to try the Quest before deciding if it’s for you. Safe Enrollment Program – this means you can enroll in ANY course and get full access instantly and still claim a full and timely refund within 10 days if it does not meet your highest expectation. When you enrolled in our recent 5 Steps to Reprogram Your Life for Abundance Masterclass with Marisa Peer, you took a huge step towards a better you in every way. But that was just the beginning of your transformational journey. Now, we’d like to encourage you to take it all the way with an exclusive $696 discount on the Mindvalley Rapid Transformational Hypnotherapy for Abundance Quest. Yes, the entire Quest is now yours for just $399 instead of $1,095. To secure that discount, just enroll on this page now before the offer expires. Plus, you still qualify for our 10-day guarantee – which lets you try a big portion of the Quest before deciding if it’s for you. 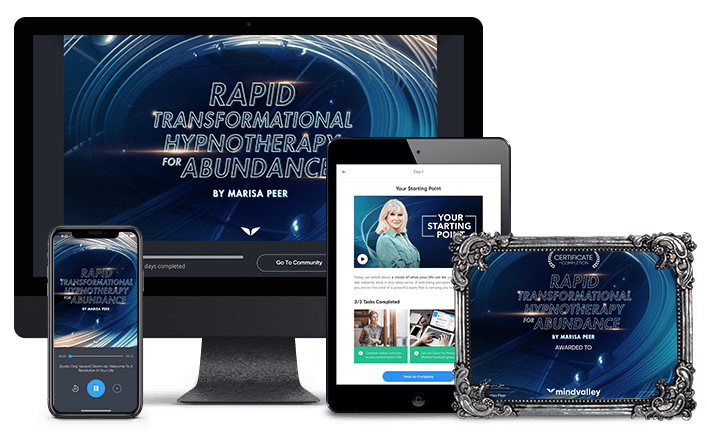 Full lifetime access to the 35-day Rapid Transformational Hypnotherapy for Abundance Quest with the hypnotherapist to the stars, Marisa Peer. Start the journey to your abundant self on March 4 with thousands of others. FREE iPad App to consume on your Apple iPad. An unconditional 10-day money-back guarantee after the start of the quest, so you can be sure this course is the perfect fit for you with no risk on your part. Did you really drop the enrollment fee by $696? Yes, it’s a real discount, for a good reason: we want to reward you for joining the Masterclass and give you an incentive to finish the journey you started. Also, since a Masterclass tends to result in a large intake of new students, we’re able to reduce our margins and instead focus on volume. It’s a win-win for everyone, and that cash saving gets passed on to you. That’s why you’re getting a 64% discount on the Rapid Transformational Hypnotherapy for Abundance Quest. But take note that this discount expires very soon, so please enroll immediately to secure yours. How exactly does the Rapid Transformational Hypnotherapy for Abundance Quest work? The Quest is an easy-to-follow journey towards awakening the full benefits of hypnotherapy in health, wealth, and love. Every day for 35 days, you’ll experience a 20 – 40 minute online micro-lesson with Marisa Peer. Each day builds on the last, and you’ll enjoy a rewarding sense of progress (that could lead to permanent change) with minimal time spent. By the end of the Quest, your mind will be completely reprogrammed to create abundance in health, wealth, and love. How is Rapid Transformational Hypnotherapy for Abundance different from Uncompromised Life? Uncompromised Life is a self-esteem program that gives you a set of tools to gain the confidence you need to achieve anything you want. While Uncompromised Life is an amazing program that gives you broader tools to use for self-esteem, Rapid Transformational Hypnotherapy for Abundance is a targeted approach to clear limiting beliefs in key areas of your life, by reprogramming your subconscious. Rapid Transformational Hypnotherapy for Abundance is a Belief Reprogramming System that takes you step-by-step to identify current beliefs that are holding you back in health, wealth, and love, let them go, and adapt new empowering beliefs for abundant living. If you’ve already done Uncompromised Life, Rapid Transformational Hypnotherapy for Abundance is a great follow-up to use the self-esteem you’ve developed to help you clear deep, emotional traumas that have bred negative and self-sabotaging beliefs. By the end of the Quest you’ll be able create extraordinary new levels of abundance in health, wealth, and love. What level of ability is required? What if I’m afraid or I have deep-seated issues? 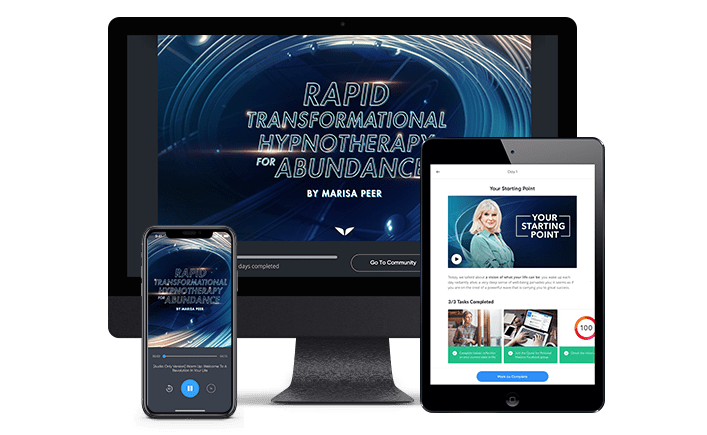 The Rapid Transformational Hypnotherapy for Abundance Quest is specifically designed to be accessible to anyone – no matter your age, past, or present circumstances. We understand that confronting your personal issues takes great courage, so this course is designed to guide you through the process without pain. You’re able to gently, yet directly address issues that are holding you back to get to the heart of what’s wrong and why. Whether you’ve never experienced hypnotherapy before or you’ve been in traditional therapy sessions, you’ll love how easy-to-follow this curriculum is, without sacrificing the transformational qualities of this practice. Not to mention the intimate support you get throughout the Quest. Do I need to do the lessons at the same time each day? Ideally, yes, because consistency helps your brain induce Rapid Transformational Therapy often, turning abundance into a lifestyle. That being said, we know that life can get a little overwhelming sometimes – so it’s perfectly fine to do your daily sessions at different times, or miss some days and catch up later (the sessions are only 20 – 40 minutes, so catching up will be easy). What’s important is you stay committed to the overall process, and finish the Quest. When does the Rapid Transformational Hypnotherapy for Abundance Quest begin? The Quest starts on May 6, 2019. Starting that day and for the next 34 days, you’ll receive daily training from Marisa and her team on your Mindvalley mobile phone app or in your Mindvalley dashboard. You’ll receive an email the day before the Quest begins and then every day throughout the 35 days. You only need 20 – 40 minutes for each daily lesson. Can I go through the Quest at my own pace? You can, and the lessons are available to you for life, so you can also study them as many times as you like. However, the Rapid Transformational Hypnotherapy for Abundance Quest is designed as a 35-day experience for daily breakthroughs and mindset clearances that shift the very foundations of your beliefs to unleash abundance. On top of that, the fact that you’re doing it with the support and energy of the community makes it even more powerful. This is why we recommend doing the Quest at the same time as everyone else, and staying as consistent as possible with it. Do you guarantee this will work for me? Rapid Transformational Therapy has been used for thousands of Marisa’s therapy clients, and countless studies prove its effectiveness. On top of that, the Mindvalley Rapid Transformational Hypnotherapy for Abundance Quest gives you training from one of the best hypnotherapists in the world, with a track record of increasing abundance in the lives of top athletes, CEOs, stars, and hundreds of members of the Mindvalley Tribe. This is how we can guarantee your success with this Quest. We’re even giving you 10 risk-free days to try it and decide if it’s for you (from the Quest start date of May 6, 2019). If in this time you decide not to continue for any reason – even if you just can’t find the time to do it – we’ll send you a full, fast, friendly refund. You don’t even need to decide now. Just grab that exclusive $696 discount, try it, and see what the Mindvalley Rapid Transformational Hypnotherapy for Abundance Quest does for you. We’re certain you’ll be overjoyed with your experience.